Energy output has boomed across the country, and this little-known dividend stock could make investors a fortune. New technologies have unlocked billions of barrels of oil and gas, even at prices that were once unthinkable. Traders betting the farm on drilling stocks over the past few months earned themselves overnight windfalls. But when it comes to energy investing, the real money isn’t always in the firms doing the grunt work. “Pick-and-shovel” businesses provide the vital tools and services to a booming industry. Rather than taking the “all-or-nothing” route of searching for the next big strike, selling rigs, gear, and equipment can be a safer (and more lucrative) way to profit. One of my favorites? Magellan Midstream Partners, L.P. (NYSE:MMP). This partnership owns pipelines, terminals, and processing plants across the country. And while it doesn’t get a lot of interest in the press, it’s one of my top dividend growth stocks for a couple of reasons. The Top Dividend Stock of 2017? After a two-year price war with the Organization of the Petroleum Exporting Countries (OPEC), the worst may be over for the U.S. energy patch. American oil producers haven’t just survived the downturn. Rather, they’ve emerged as lean operating machines, which can turn a profit even at low commodity prices. The West Texas Permian Basin has led this comeback. Frackers have raced to ramp up production over the past year, more than doubling the number of rigs operating in the area. That forced the Energy Information Agency to boost its forecast for U.S. oil production, with output expected to hit a record 9.3-million barrels per day (BPD) by the end of 2018. It’s good news for suppliers. The boom has created shortages for everything from drilling fluid to rig equipment. In shale country, truck drivers pull down $80,000 per year. Surging production means more demand for energy related infrastructure, too. You have a desperate need for more pipelines, storage tanks, and processing facilities. Some analysts think that Permian output could outstrip pipeline capacity by the end of 2017. Magellan has positioned itself right smack-dab in the middle of this boom. The partnership owns 14,000 miles of pipelines across the Midwest. These lines act like the toll roads of the energy industry, shipping crude from wellhead to market. While wildcatters bet everything on the next big strike, Magellan earns steady fees on each barrel coming out of the ground. Management has poured millions to expand operations in the region. A newly built pipeline origin point at Bryan, Texas will add another route out of the Permian. The expansion of the partnership’s BridgeTex Pipeline network will increase capacity to 400,000 BPD, shipping West Texas Permian crude to refineries on the Gulf of Mexico. Executives also wants to build a marine terminal in Pasadena, Texas. The facility will hold one-million barrels of refined products like gasoline, jet fuel, and heating oil. And while the project still needs the green light from regulatory officials, management expects the terminal to begin operations by early 2019. All of which provides a nice tailwind for Magellan. Executives reaffirmed their earnings guidance on a conference call last week, projecting another round of record profits and distributable cashflows. Most of those distributable cashflows should get passed on to owners. 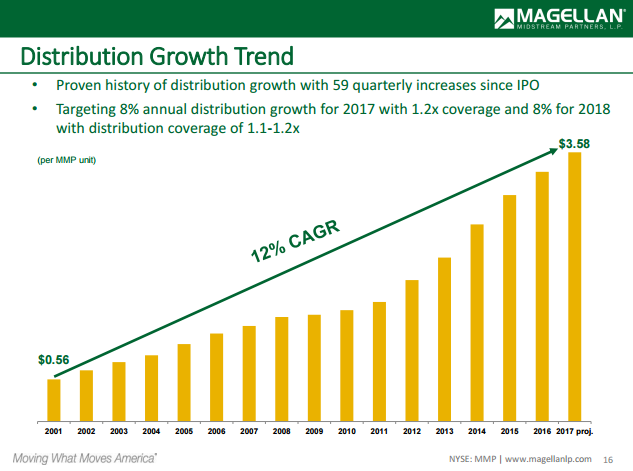 Since 2001, Magellan has hiked its payout by about 12% per year. If you had bought and held the stock over that time, your yield on cost would now top 115%. Today, the partnership sports one of the highest payouts around. Last quarter, management mailed out a distribution of $0.87. On a full-year basis, that represents a tidy yield of 4.7%. That payout should keep growing. Going forward, management expects to increase the partnership’s distribution by eight percent in 2017. Owners can likely count on a growing stream of income for years to come, especially given the boom in West Texas. Source: “Evercore ISI Energy Summit,” Magellan Midstream Partners, L.P.
Of course, you can’t call Magellan a sure thing. Another leg down in oil prices could cut the energy boom out from the knees. Higher interest rates would crimp the unit price, as investors flee risky equities for safer bonds. That said, I’m not super worried. Magellan earns most of its profits from tariffs. As a result, these cash flows resemble bond coupons. While oil prices can swing wildly from year to year, the actual volume of crude moving through the oil patch stays fairly consistent. This payout is also one of the more dependable around. The partnership earns $1.20 in distributable cash flow for every dollar paid out to unitholders. This gives management plenty of buffer room in the event of a downturn. Executives have also taken a near prudish approach to debt. Other MLPs got into trouble during the last cycle by over extending their balance sheets. Magellan, in contrast, has only $3.51 in net debt for every dollar generated in EBITDA. This leverage ratio represents one of the most conservative in the industry and has allowed management to sail through any downturn. You can see this model pay off in the company’s financial results; Magellan has never skipped a single payment to unitholders. Through the two recent downturns in the oil patch, executives even managed to increase the distribution. Get ready for Oil Boom 2.0. These drillers have trimmed a lot of the fat from their businesses. If oil prices stay above $50.00 a barrel, output could surge again over the next few years. Income investors, however, don’t need to bet the farm. Rather than trying to strike it rich on the next gusher, “pick-and-shovel” plays like pipelines provide the surer, safer way to profit. For this reason, Magellan Midstream Partners represents one of my best dividend growth stocks for 2017.